All of the basketball workouts in this section are designed to help players improve their athleticism. They will work on a variety of different areas of athleticism as well. Players will be able to develop their vertical jump, improve agility, increase functional basketball strength, improve stability, increase speed, and more. This is going to translate over to the basketball court and will allow a player to get a physical advantage on their opponent. For example, if a player is able to be a step quicker on offense, they will be able to get driving angles to wherever they want to go. If they are a step quicker on defense, they will be able to keep their opponent from getting where they want to go. Some players are more naturally gifted, but it all starts with spending time working on and developing quickness, strength, speed, vertical, etc. These basketball workouts are designed by professional trainers for all age groups and skill levels. Our trainers have put in years of hard work, studied the human body, and have learned how to make it stronger and faster. You will be able to learn in minutes the drills that they have spent years fine-tuning and developing. 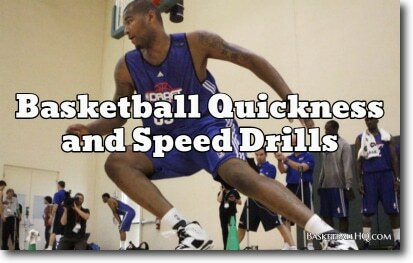 Basketball is becoming a sport where quickness and speed is a must if you want to compete at a high level. So whether you are a coach/trainer or a basketball player, this section of basketball workouts is going to have all the tools that you will need. 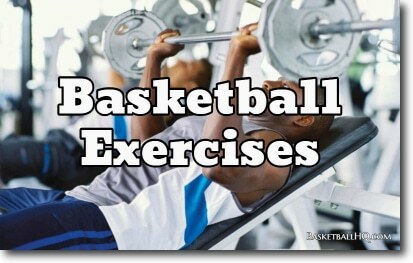 Some of the workouts require training tools, so make sure that you visit our list of basketball training equipment if you need one of the tools. As a basketball coach, you are sometimes asked to double up as a strength trainer if there is not the budget for one. In cases like this, if you have not had a background in sports training, it can be a challenging task. With these workout videos, you will be able to have everything that you need to step into that role with your team. The trainer in each video will breakdown every movement, teach the exercise or drill, and then a high-level player will demonstrate it. All of this will allow you to not only be able to turn around and teach it to your players but also critique their form and technique. This is going to be essential for a player’s athletic development. The other great thing about all of these training videos is that they are basketball specific. Yes, some of the movements will translate to multiple sports, but they are primarily geared for basketball. So as a coach, you are going to know that doing these basketball workouts is adding value to your players and team. If you already have a sports training background, use these videos for new material. All of the trainers featured are experts and will provide high-level material. So make sure to take advantage of everything that they have provided. Most basketball players don’t have access to a high-level personal trainer, at least without paying a fortune. That is why these basketball workouts exist. Our athletic trainers have worked with professional and college athletes and will be able to provide you with the tools that you need to develop. Each of the training videos will show you exactly how to do the movements so that you can replicate it on your own later. 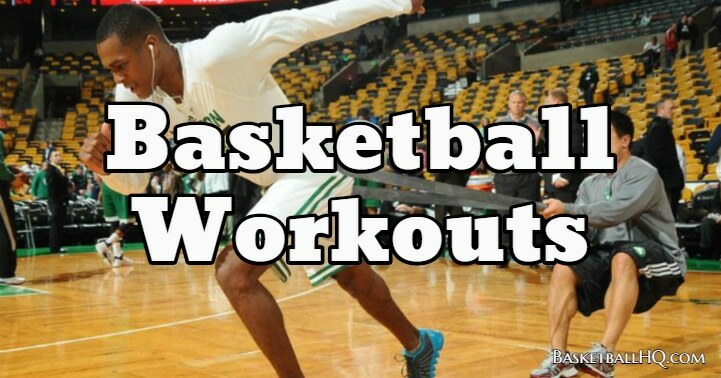 This will allow you to be able to jump higher, run faster, move quicker, etc. All of this will translate over to the court as well. It is critical though that when you are watching the videos, you lock in on correct form. Each video will come with detailed instructions, and the better you can follow that instruction, the more the drill will help you. So really make sure to pay attention to each movement that is executed before practicing it on your own. The good thing about all of our training videos is that you can take them to the gym with you. Our iPhone and Android app will allow you to pull up the video right there with you in the gym while you are working out if need be. Also, with our Pro Membership, you will get access to already created training plans from our expert trainers. As a basketball trainer, you are responsible for a player’s complete development. This includes agility, quickness, vertical, etc. That is why the basketball workouts in this section should be your new best friend. They will provide you with everything that you need to start developing a player’s athleticism. This will allow you to add another area of value to your clients. If players are able to be more explosive, quicker, stronger, etc. you will look that much better as a trainer. Also, with all of the workouts being geared for basketball specific movements, the basketball moves that you teach your players will be that much better. For example, when you teach a player to rip through to the basket and also work with them on being more explosive, it makes that move that much better. So whether you have an athletic training background or not, make sure to maximize these basketball workouts with your players. They will provide a ton of value to the players that you work with. Footwork covers so many different areas of the game for a player. Whether it is shooting, finishing, defensive slides, etc., the list goes on and on. The better a player’s footwork is, the better they will be able to execute these different movements. Players with excellent footwork seem like they are moving effortlessly into different moves. Whereas on the flip side, it is easy to notice a player that struggles with their footwork. As a player, you want to be as light and quick on your feet as possible. You also want to be as efficient as you can with your movements. 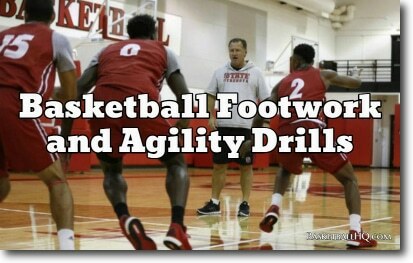 The footwork and agility drills in this section are going to work on all of these areas. They will allow a player to be light on their feet and move in any direction quickly and efficiently. From being able to move forward, backward, or laterally, these different drills will train players to be able to move in any direction with ease. This is important in basketball because a player is almost always in a state of needing to be able to move in any direction at a split seconds notice. This section is going to be perfect for both coaches, and also players to use on their own. Some of the drills will require a partner, but most of them can be scaled up or down to fit the needed number of players. So whether you are a coach looking for footwork and agility drills for your team, or a player looking to train on their own, this section offers drills for both. All of these drills are going to focus on a player’s footwork and their ability to move smoothly in any direction. This will help players move fluidly and smoothly on the court as they make different movements. It is one thing for a player to be either skilled or quick/fast, it is a whole new ball game though when a player has both. For example, if a player is an excellent ball handler but not quick, they won’t be able to get an angle. Vice versa, if a player is really quick but has no handles, they will constantly be turning the ball over. The point is that players need to be well rounded, and that means spending the required time developing speed and quickness. This section is going to have everything that is needed to develop a player’s speed and quickness. It will also offer a variety of different levels of drills to select from as well. So regardless of the player’s level, there is going to be speed and quickness drills to choose from. A big part of being fast or quick is being efficient with your movements. So not only will these training videos provide different speed and quickness drills, but they will also break down each movement and will teach players how to move the correct way. If a player can remove an unneeded step or movement from a move, they will become that much quicker. With all of these training videos, you will be able to see the correct way to execute each move. The different drills in this section are going to be great for both players and coaches. Some of the drills will require a partner, but most can be done by a single player on their own. From moving forward, backward, and laterally, these drills are going to work on a player’s ability to be quick and fast in every direction. The training videos will teach technique as well as provide drills to rep the different movements. The more that the game of basketball progresses, the more emphasis is put on physical abilities. Skill is still a big factor, but if a player is not able to keep up physically as well, it will be tough for them to have success. This means that players need also to be spending time developing their strength and explosiveness in the weight room. Not only will the weight room help with physical development, but it will also help to prevent injuries as well. By working on stabilizer muscles, a player can do their best to help protect their body from potential injuries down the road. The basketball exercises in this section are to not only going to demonstrate each exercise but also breakdown the details of it as well. This will allow for making sure that the player is executing the exercise correctly. From squats to hang cleans to everything else, this section is a must for players and teams in the weight room. And, while these exercises are naturally going to benefit other sports as well, they are all going to translate to the basketball court. Players will be able to jump higher, post up stronger, finish through contact better, and so much more. The weight room is a must for basketball players that are serious about fully developing their game. 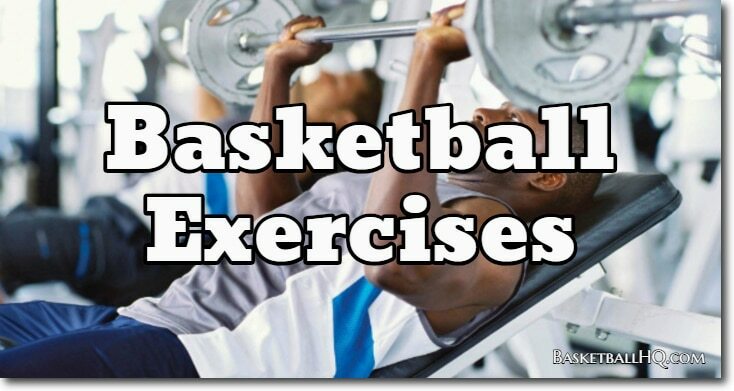 All of these basketball exercises can be done with a single player or with an entire team. So whether you are a player looking for help in the gym or a coach with your players, you will be able to use all of the exercises offered. If you are a player on your own, make sure to use a spotter when needed. This will keep you safe, and also allow you to challenge yourself better as well. All of these training videos are going to be in the weight room. They will breakdown and teach the correct form for different exercises that basketball players should be using. Great footwork is about having light, quick feet that are ready to move in any direction at any moment. When you watch a player with good footwork, it almost seems effortless the way that they are able to move. Jumping rope is going to be an excellent way to work on developing this effortless-looking footwork. This is not going to be schoolyard jump rope though. The jump rope drills in this section are going to range from a basic two foot jump to expert level. All of them though, are going to be executed at a high-level that will translate to a player developing light, quick feet. Not only are these jump rope drills great for working on footwork, but they are also a great way to work on conditioning. If a player is willing to go full speed for a longer duration of time, they will start developing their cardio as well. This is a great way to train because the player is able to work on both footwork and getting in better shape at the same time. 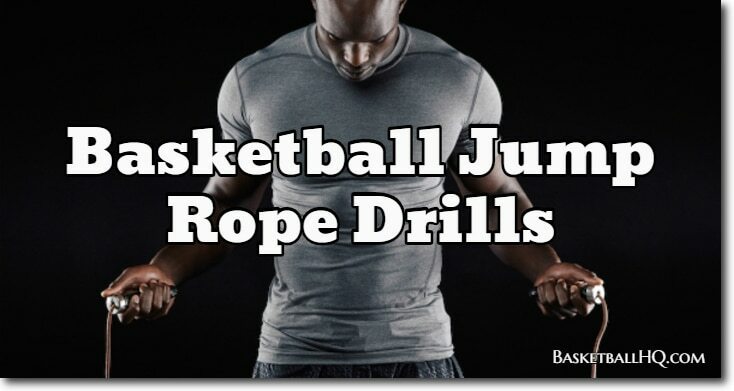 Jump rope drills can be done pretty much anywhere, so they are going to be an excellent option for both coaches with their team and players on their own. A great time to use them for both is right before a workout to get warmed up. You could also use them as part of a circuit or at the end of a workout to focus more on the conditioning aspect of jumping rope. Regardless of when you decide to use them though, jump roping should be a regular part of your basketball training routine. 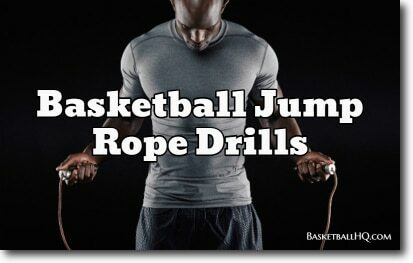 All of the training videos in this section are going to cover different types of jump rope drills players can use. Some will work on quick feet, while others will focus on developing explosiveness. If you have been around the game of basketball for any period of time, you are familiar with how important it is to be explosive with your moves. And, while there are several different ways to develop this, one of the best ways is by using resistance bands. Resistance bands will help players develop that change of speed and explosiveness that makes different moves so deadly. The way that resistance bands work is pretty cool. What they do is trick a player’s body into working harder than it usually would. As the player is moving with a resistance band, their body will recognize the resistance. It will then put out more effort to compensate for this added resistance. The cool part though is that once the band is removed, the body is now accustomed to putting out this extra energy. However, the player no longer has the resistance band on, and that additional energy output turns into pure explosiveness. The other great thing about these resistance band drills is that they are going to work on basketball-specific movements. 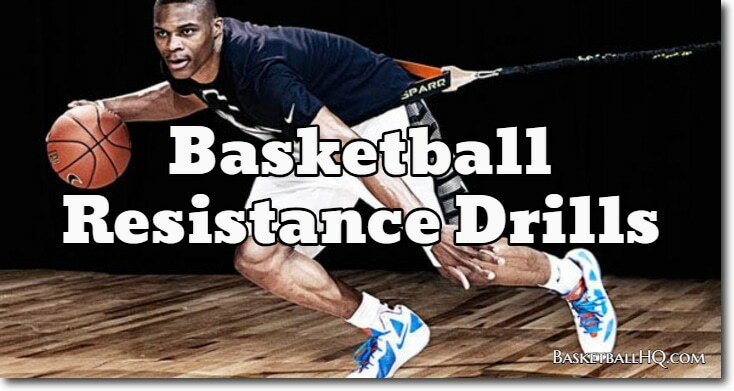 There are resistance drills to work on first step explosiveness, finishing, defensive slides, rip-throughs, and more. So if a player is needing to work on being more explosive at a specific move, they can choose a resistance drill to work on that move. 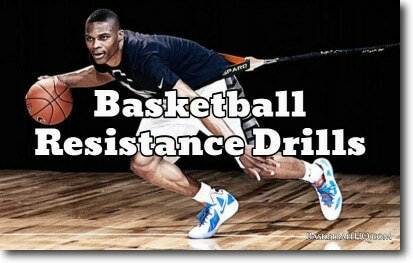 These resistance band drills can be done with as a team or with a small group of players. As a player, you can do them as well; you will just need a partner to hold the resistance band for you. Also, most of the difficulty level of the drill is determined by the person holding the band. So it is important that as a coach or player, you also watch how to hold the band for each type of resistance drill. This will make a big difference in helping the player that is going through the drill be more explosive. Each of the drills in this section will require a resistance band. The drills will work on different basketball-specific moves and will allow players to work on making explosive movements. When you think of vertical, you almost always immediately associate it with dunking. Players want to increase their vertical so that they can posterize someone with a dunk, but vertical is more than just dunking. There are so many other areas of the game that are impacted by a player’s vertical. Rebounding, contesting shots, finishing, jumping passing lanes, and playing free safety in a pressing zone are just some of them. All of these are areas though, add value to a player’s game and to a team. And, with a higher vertical, a player can better excel at them. 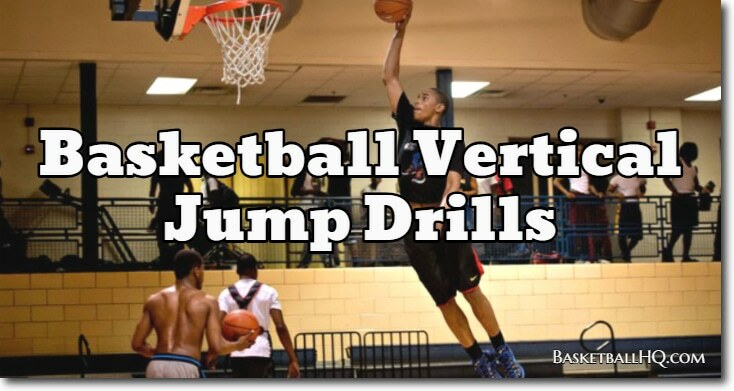 These basketball vertical jump drills will help a player better perform in all of those areas. They will work on jumping in a variety of different ways as well. As a player, you need to be able to jump off of one foot, two feet, have a quick second jump, etc. 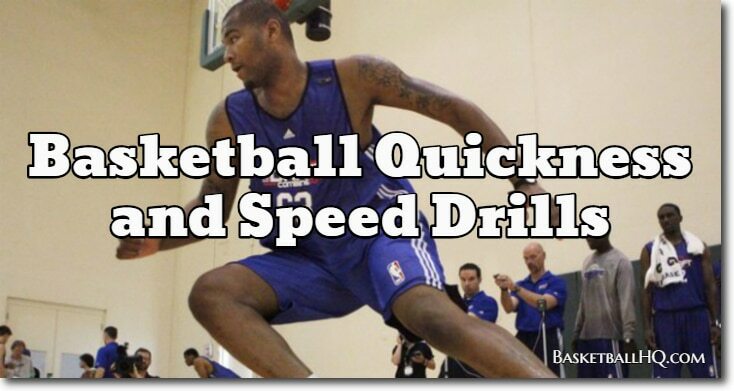 With these drills, you will be able to work on all of these different areas. Along with providing the drills needed to work on a player’s vertical, these training videos will also explain the correct way to jump. Because as much as jumping is about developing stronger legs, it is also about developing the proper jumping technique. The way a player loads, extends upwards, etc. all add up to a player becoming a better jumper. 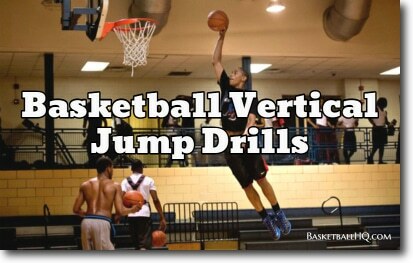 All of these vertical jumping drills can be done as a single player or scaled up for a team workout. So whether you are an individual player or a coach with their team, these drills will be able to work for you. All of these training videos in this section are going to work on a player’s vertical jump and explosiveness. They will help players not only jump higher, but jump quicker, and jump multiple times in a row quicker. If you look back at any of the old NBA or college basketball games, you will see a stark difference between the overall levels of athleticism in today’s game compared to back then. Players today are more athletic than they have ever been before. And, as mentioned previously, this does not mean that skill takes a back seat, but it does, however, mean that athleticism should not be overlooked. And this is true for all players. Even if you are already naturally athletic, these training videos are going to help you become even more explosive, fast, etc. Regardless of where you currently are athletically, you should still be spending time work on these areas. As a coach, it can be tempting to overlook basketball workouts like this because you have so much else to focus on. 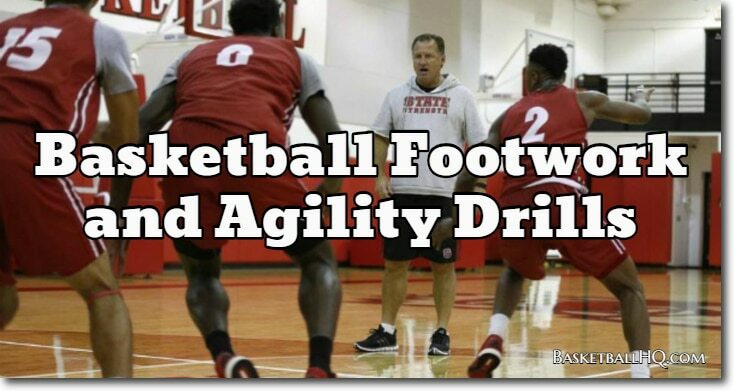 If you want your players to be able to execute, battle on the boards, play tough defense, and whatever else though, they need to have the physical capabilities to do what is asked of them. This means that you must be willing to spend time in the weight room or on the court developing these different areas. In the long run, you will see a noticeable difference in your team’s physical abilities on the court. So take advantage of all of the basketball workouts and don’t worry if you are not an expert athletic trainer. Just follow the videos instructions, and you will be able to develop as a player on your own or as a coach with your team. Also, if you are a coach looking for a training plan for your team, make sure that you check out our Pro Membership. In our Pro Membership, you will get access to a team training workout that was created by a Division 1 college strength coach.